Christen Press scored once, Julie Johnston scored twice, and Tobin Heath notched two assists as the U.S. Women defeated Colombia 3-0 in a friendly on Sunday at Talen Energy Stadium. The Americans managed 22 shots with 1o on target, and only a fantastic effort from Colombia goalkeeper Catalina Perez kept the score close. Jill Ellis’ made a few changes to the team that thumped Colombia, 7-0, on Wednesday, most notably with Alyssa Naeher coming in to start at goalkeeper and midfielder Tobin Heath given a chance to start in the right back spot. Despite several opportunities, it took some time for the Americans to find their way through an organized Colombia defense. Christen Press finally got the U.S. on the board in the 27th minute when Lindsey Horan played a well weighted ball over the top that Press ran onto and deftly flicked over the onrushing Colombian goalkeeper. The U.S. would double their lead shortly before halftime. Tobin Heath’s set piece delivery from the right side curled toward Julie Johnston, who had cut to the near post. Johnston did ever so well to flick the cross over the top of Catalina Perez and into the far corner to make it 2-0. The Americans continued to pressure the Colombians in the second half. 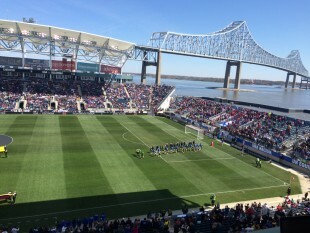 Local hero and American captain Carli Lloyd appeared driven to get onto the score sheet in front of the sold out crowd, but could not find the final touch for most of the match. Perhaps her best opportunity came from a free kick just 19 yards from the Colombian goal that she fired into the wall before hammering the rebound well over the crossbar. Johnston picked up her second goal of the match in the 79th minute, with the assist again coming from a Tobin Heath set piece. This time Heath crossed well from near the end line on the right side and Johnston dove from her markers on the near post to flick a header past Perez into the far side of goal. The goal was Johnston’s 7th of her international career, with all 7 coming from set pieces. The announced attendance on a brisk day in Chester was 17,275. The U.S. Women are next in action on June 2, when they take on Japan in a friendly in Colorado. Although the US dominated, I didn’t think they played particularly well. Clearly they were the more talented team, but they didn’t seem to really be playing well as a cohesive unit. Also, Colombia was dropping everyone behind the ball allowing the US defenders to play about 35 yards from the Colombia goal and keep the pressure on without fear of a counterattack (something I strongly disagree with the way the Union defend set pieces, bringing everyone back). Against a stronger opponent, the US easily could have been in trouble the way they played. It was definitely a different atmosphere than for a Union game. The SOB’s are much louder than the American Outlaws (the Outlaws seemed to have a very small contingent). When the players came out for the processional, the announcer didn’t ask everyone to please rise and welcome…I was one of the few people standing prior to the national anthems. Nice match in favor of USA… thanks for your kind attention to current detailed information!!! Im just gonna say that I was more than a little disappointed that the women signed very few qutographs after the game. They waved and went in. Many waited and no one came except lloyd who came out for her special fans in the corner. I don’t begrudge her that. This was a rare opportunity that many fans (specifically little girls) waited around the fences and boards for 40 minutes in hopes a few would come out, a few would sign autographs, take photos, a few would make the 2-3 hour journey many made to see their heros an even more special moment ( my niece included), to see those they look up to a little closer. it was a friendly. a money making journey. a supposed thanks to the fans that everyone paid 35-165 dollars plus a piece to see. The thing is that without those fans there is no womens soccer, there is no fair wage fight, there isn’t a reason for their existence. A friend of mine went to a mens international friendly and remarked how many of the guys hung around for 1 hour plus thanking fans, taking photos, signing autographs. I expected more and was very disappointed.